Get here early to collect your free winter goody bag and to book a free back massage to help ease the seasonal stress that can mount up as we approach Christmas. 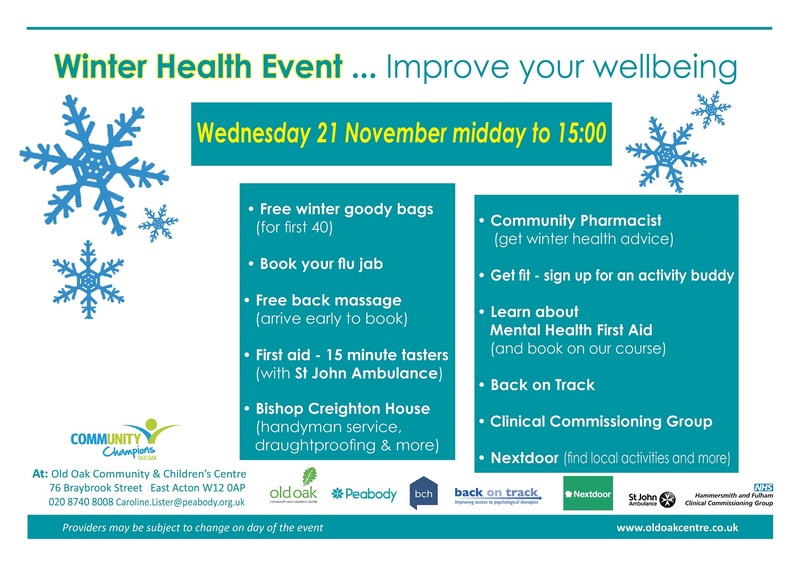 The Old Oak Winter Health Event offers you a select group of partner organisations with health advice and opportunities to improve your physical health and emotional wellbeing as well as local free courses and activities to kick off 2019. Join St John Ambulance for a 15 minute first aid taster session then sign up for a free course. Chat with our Community Champion volunteers and try our brief mental health awareness quiz then have the chance to sign up to our accredited two day Mental Health First Aid course. This gives people the skills and knowledge to help a person in mental distress until they can get professional help. We offer this excellent course free to Hammersmith & Fulham residents. If you prefer a physical activity challenge for the New Year and would like to get fit but lack the motivation, then we have the answer! Talk to our new staff member, Naomi, who can link you with a friendly local activity buddy who can keep you company and exercise with you. Come and make the most of this great new project at Old Oak whether you want to try the green gym, do an exercise class or go for a bracing walk on Wormwood Scrubs. And if you fancy seeing what else the neighbourhood has to offer sign up for the Nextdoor app and connect with other local people. 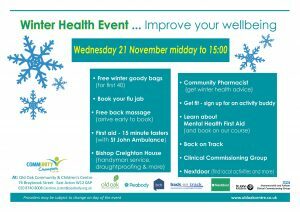 At our winter event you can also meet the Community Pharmacist to get winter health advice and book your flu jab or chat to staff from Bishop Creighton House about draught proofing your home or booking their handyman service. This event is free and there is no need to book in advance. Old Oak Community Centre is easy to find (Click Here for a map): take Central Line to East Acton Station, exit station and turn left along Erconwald Street and walk to end, turn right into Braybrook Street, cross road and Centre is on your left. The Centre has step-free access throughout.